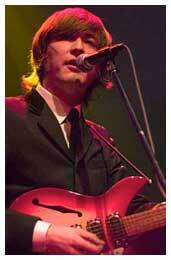 Four lads from the heart of Tokyo's, "The Cavern Club," is The Silver Beats. The most authentic Beatles tribute band that gives the excitement and energy of The Beatles era. The Silver Beats are the most popular BEATLES TRIBUTE BAND act from Tokyo, Japan, and since their 2002 Beatles tribute band debut at Tokyo’s world renowned Cavern Club, they have received national and international acclaim for their faithful tribute & reproduction of The Beatles music, and style. This acclaim includes endorsements from such music notables as Denny Laine (Wings), Alan Parsons, Tower of Power, Brian May and Roger Taylor (Queen), Keith Emerson (ELP) and The Killers. There was even a personal backstage meeting with Sir Paul McCartney of the original Beatles, where McCartney introduced the band’s “Paul” (Tadaaki Naganuma), as the “Japanese Paul”! In addition to performing 5 nights a week at the Cavern Club, they have also performed numerous corporate and national events throughout Japan, have appeared on Japanese national television, as well as print media in Japan, USA, and Europe. 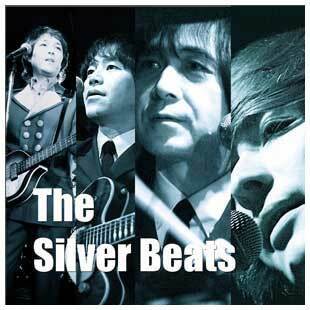 In addition to Japan, the Silver Beats have also performed in the UK, and now in America. 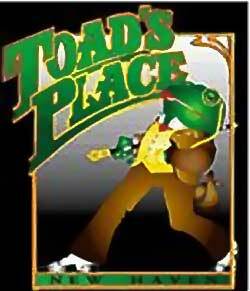 The best tribute band ever! In America the “Beats” has been interviewed and/or noted in major print publications such as the Milwaukee Journal, Mercury Sun, Spin Magazine Online, Rolling Stone, The Washington Post, and most recently, an interview for NPR’s “all Things Considered”(Jan. 2008). In early 2007 multi platinum recording artists “The Killers” were in Tokyo filming a music video, and went to the Cavern Club to see the “Beats”. They were so impressed that they asked them to open as direct support for their upcoming US tour, which would include sold out appearances at some of America’s most historic and important venues including The Ryman Auditorium in Nashville, and Madison Square Garden in NYC. The Silver Beats accepted and performed a total of 6 sold out shows to incredible crowd response and rave reviews. More Info? Upcoming tour ? Here is what David Malitz had to say, how it went with the festival. 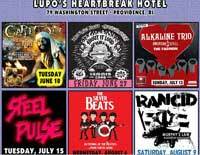 Aug, 6, 2008 at Lupo's Heartbreak Hotel in Providence, Rhode Island. Starting their U.S. Tour, the silver Beats performs for the night at 9:00 P. M.. Reserve your tickets here! Official: Aug. 08,2008 in New York City, Times Square in B.B. 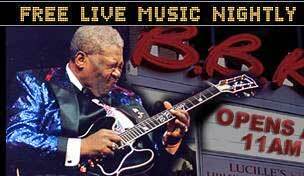 King's Blues Bar & Grill, The Silver Beats will perform. Tickets for the show is on sale!. Show Time: 7:30 P.M. Right Here! Yeah, Yeah ,Yeah! 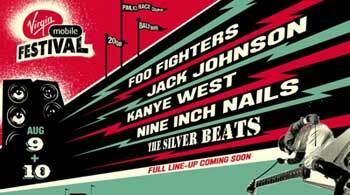 Official: The Silver Beats will be performing at the 2008 Virgin Mobile Music Festival on Aug. 9th 2008 a long with the headliners and continue the North American Tour till Aug. 20th. For more booking info, contact us. Here is how it went with the festival from reporter of Washington Post. Our complete Bio and Info can be downloaded here: PDF size 648 kb!